Japan’s Prime Minister Shinzo Abe speaks during a press conference at his official residence in Tokyo on Tuesday. 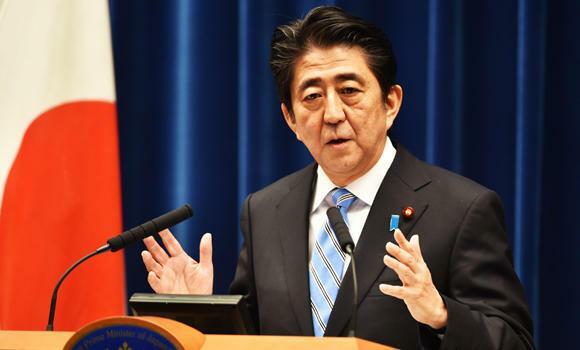 TOKYO: Prime Minister Shinzo Abe said Tuesday he was calling a snap election and delaying an expected sales tax rise after figures showed Japan was in recession. Less than two years after he swept to power pledging to reinvigorate the flagging economy, Abe will go to the polls — probably in the middle of next month — telling voters that more needs to be done to fix years of growth-sapping price declines. “I will dissolve the lower chamber on (November) 21st,” Abe told a news conference. He did not give a date for the election, which was not due until 2016, but the media consensus is that it will be Sunday, December 14. The last 24 months have seen two of the so-called “three arrows” of “Abenomics” fired — massive fiscal stimulus and a flood of easy money. A third “arrow” of structural reforms remains stuck in the quiver, a victim of the vested interests it is intended to undermine. At its heart, Abenomics is intended to push prices up and get Japanese shoppers spending, with the aim of generating a self-reinforcing recovery as companies employ more people to meet growing demand. The measures have sent the yen plunging, pushing up the cost of imports, including the fossil fuels used to power the country.